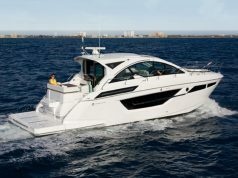 Centre consoles, with wide-open cockpits and seaworthy hulls, are popular offshore fishing boats, but many of today’s most successful models also work well for family outings and watersports. Yamaha’s new 19-foot 190 FSH series, launched last fall for 2016, adds an inboard waterjet version. Its fishing equipment includes an 18-gallon livewell, two casting decks, storage for 10 rods, insulated fish-box, and a raw water wash down system. It also has a long list of features for a great family getaway machine. There’s a self-draining cooler, leaning-post helm seat, aft jump seats, forward console seat and plenty of storage. The lifting console seat unit and a privacy curtain create a usable dressing room and head. There are steps for easy access forward. The aft deck is also easy to reach and has Yamaha’s signature water-level aft-facing seats, plus a towing eye and hideaway swim ladder. Anglers and day-cruisers alike will appreciate the pop-up cleats and dedicated anchor locker. Same goes for the torque-laden 1.8 L four-cylinder engine driving an axial-flow waterjet pump. The 180-hp fuel-injected High Output four-stroke powerplant provides economical but spirited performance. In GPS-based testing, the 190 FSH Sport, complete with T-top, hits a top speed of 38 mph at 7,500 rpm. Cruise comfortably at 27 mph at 6000 rpm or 32 mph at 6500 rpm. A stepped hull helps boost acceleration and hole shots while the 190’s Articulating Keel improves low-speed tracking. 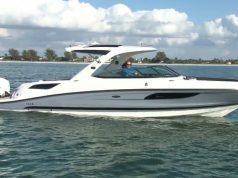 The 190 FSH is responsive and handles waves well. 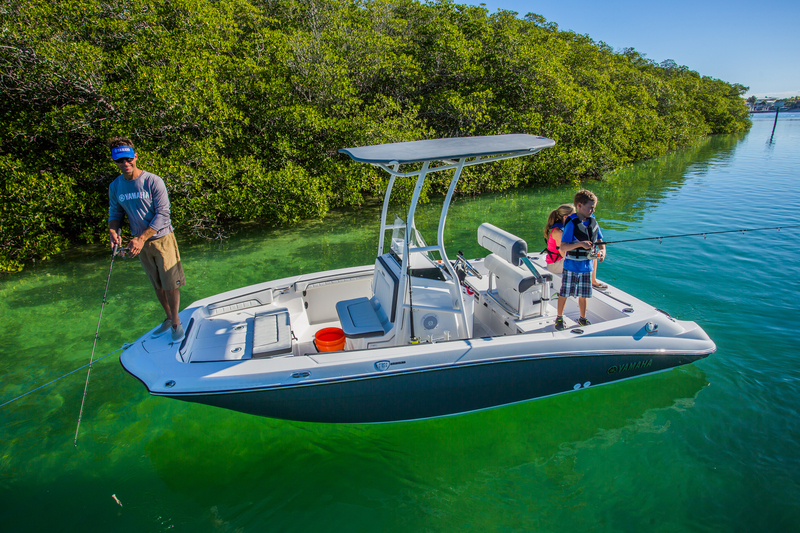 In both Sport and Deluxe versions, the 190 FSH is sleek, speedy and versatile – ideal for fishing and family fun. Centre consoles with wide-open cockpits are popular offshore sport fishing boats, but many fishermen feel the pressure to select a boat that will also work well for family outings and watersports. Yamaha’s inboard waterjet 190 FSH is guaranteed to make everyone smile. With elevated casting platforms at the bow and stern, it’s easy to see this Yamaha was designed with the angler in mind. The bow platform is home to an anchor locker, an insulated fish box, and a forward facing console seat. Rod storage is not a problem, with room for up to 14 rods below the gunnels and along each side of the console. The console is covered by a sturdy T-Top and has plenty of open and closed storage. The layout is impressive, with space for multiple electronics options. 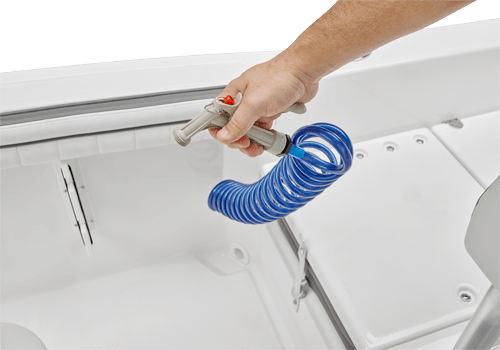 The helm seat sits atop a self-draining cooler and is outfitted with a leaning post that moves forward and aft. 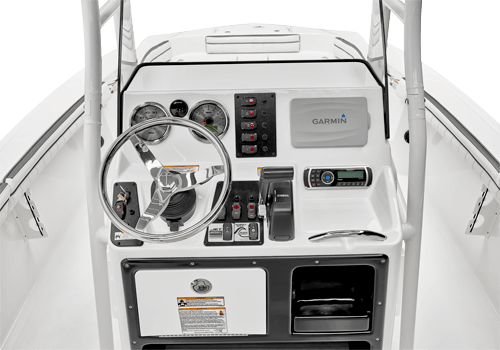 The rear-casting platform has flip-up aft jump seats incorporated into the deck as well as another anchor locker, wet storage, and a five-gallon bait bucket well. The raw water wash down, located at the stern, and self-bailing deck are very convenient for cleaning up at the end of a long day. 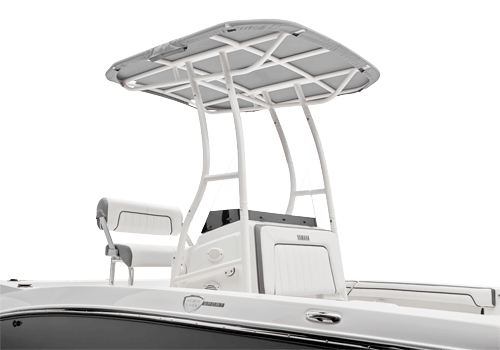 The 16-inch draft and jet drive means that this boat can go almost anywhere, allowing you to get into those hard to reach fishing areas. The new Yamaha 190 FSH has sleek, fast lines and the guts to go where others cannot.